The European Space Agency (ESA) and NASA have signed a statement of intent to jointly explore various options related to a potential Mars Sample Return (MSR) mission in the next decade. Returning Martian samples to Earth has long been a goal for the world’s spaceflight agencies, with new promotional materials from NASA indicating that the agency’s Space Launch System (SLS) rocket and Orion crew vehicle might have a role to play in such a mission – even though Mars Sample Return has not been discussed by NASA in terms of SLS and Orion in several years. The new statement of intent between NASA and ESA mainly focused on the joint capabilities of both agencies to achieve the goal of bringing Mars soil and rock samples back to Earth. For NASA, the announcement signals a shift back toward ambitious, high profile, deep space missions. Under the rough mission outline described in the ESA announcement, NASA’s upcoming Mars 2020 rover – a follow-on mission from the on-going Curiosity rover – would act as the first step in the three-part mission. Mars 2020, which will eventually get a more colloquial name, will collect up to 31 surface samples and place them in pen-sized canisters as it explores the Red Planet, canisters that would be left on the Martian surface for subsequent retrieval. A second mission would then deliver a “fetch rover” and a Mars Ascent Vehicle (MAV) to Mars’ surface quite close to the location of the Mars 2020 rover. The fetch rover would then roam the Red Planet’s surface, essentially performing Martian search-and-rescue operations as it finds, grabs, and brings the left-behind sample canisters back to the MAV. The sample canisters would all be placed in a single container on top of the MAV – a small rocket that would then launch the samples into Mars orbit. A third launch from Earth would provide an Earth Return spacecraft sent to orbit Mars and rendezvous with the sample container. The sample container would then be placed safely inside an Earth reentry module, and the Earth Return spacecraft would make the journey back to Earth. Upon arriving at Earth, the reentry vehicle would be released from the main Earth Return vehicle, enter Earth’s atmosphere, and land in the United States where the samples would be retrieved and placed in quarantine for detailed analysis by a team of international scientists. 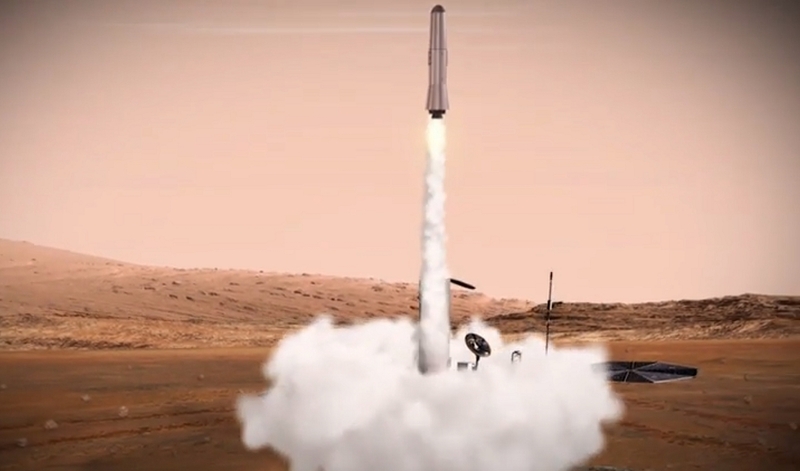 “A Mars sample return mission is a tantalizing but achievable vision that lies at the intersection of many good reasons to explore space,” noted ESA’s Director of Human and Robotic Exploration, David Parker. Exactly how this Mars Sample Return mission plan develops in the upcoming years will involve trade studies and refinements based on the various options and technologies available, with ESA clearly stating that the mission will in some way involve commercial partnership. The specific three-mission sequence is also likely to “compete” with a number of alternative options, albeit along the common theme of using a Mars rover to collect samples before an MAV rocket shoots the canister into space for retrieval. Intriguingly, though not part of the official statement of intent announcement, after years of not receiving any mentions relating to NASA’s roadmap, MSR graphics recently found their way back into SLS and Orion deep space promo videos, as an example of such a sample return mission coming back into the limelight for the U.S. space agency. Despite having not been mentioned in recent years, NASA had originally considered using SLS and a crewed Orion vehicle to conduct a MSR mission. This initial consideration came early in SLS’s lifetime, shortly after the cancellation of the Constellation Program (CxP), and was used as early Design Reference Mission (DRM) work as part of NASA’s efforts to find a range of missions for its Super Heavy Lift Vehicle. This DRM work was later refined and then promoted via a 2012 NASA Advisory Council (NAC) document relating to future Mars missions. At the time, MSR was shown as having three flight profile options, involving one, two and three launches – the latter of which being more or less identical to the newly announced MSR mission via the ESA/NASA statement of intent. All of the 2012 NAC-promoted SLS MSR options revolved around the key elements of a sampling rover (which has now become the Mars 2020 rover), an MAV and its associated fetch rover, and the return orbiter – which back then would have been powered by Solar Electric Propulsion (SEP) – for the sample’s return to Earth. The 2012 study, titled “Opportunity: Science Payloads on SLS”, included an option to launch the entire MSR mission (sampling rover, MAV, and return spacecraft) in a “single-shot” launch using the SLS. The document intimated such a single-shot mission could have been launched in 2024, indicating that such a mission would utilize the Block 1B SLS, which is now not expected to be online until the second half of the 2020s. 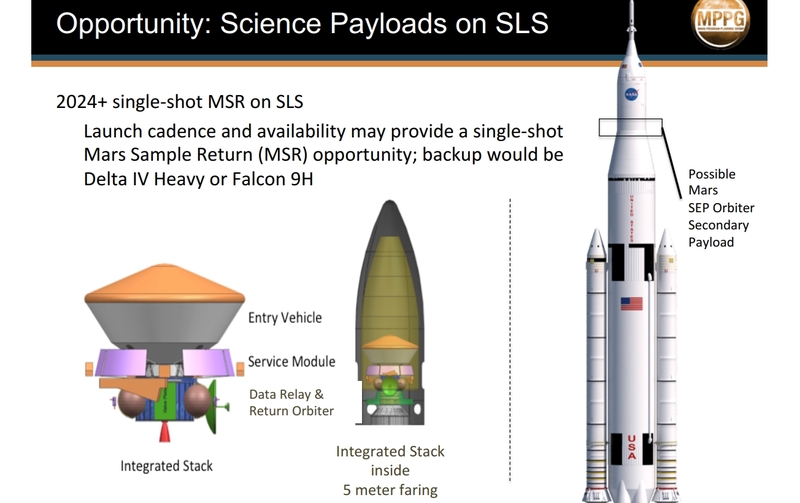 The same documentation also showed an SLS in its Orion launch configuration, citing the possibility of launching only the return orbiter as a secondary payload with an Orion mission. An element of honesty in the mission evaluation was shown by adding that such a MSR single-shot mission could also have been launched on a commercial rocket, with Delta IV-Heavy and “Falcon 9H” (now known as Falcon Heavy) listed as the rockets powerful enough to launch the mission – though for the purposes of an SLS-approving overview they are listed as “back ups”. However, even if the 2012 MSR proposal had come to fruition and launched on a much cheaper commercial rocket, SLS and Orion would still have played a role, with a crewed Orion being sent to intercept the sample return orbiter upon its arrival back in Earth or lunar orbit. The use of Orion was promoted as a way to address a major concern of any MSR mission: planetary protection. Under the recent ESA mission overview for MSR, the Mars sample container would be returned back to Earth via its own re-entry capsule. The issues with such an approach and its relation to planetary protection were seen via the return of the Genesis Capsule in 2001, which failed to deploy its chute and crashed into the Utah desert. The 2012 NAC document noted that while using a crewed Orion would help NASA in its goal to test crewed mission variety in deep space, it would also help protect the samples on their return back to Earth. “Sample canister could be captured, inspected, encased and retrieved telerobotically. The robot brings the sample back and rendezvous with a crewed vehicle. Cleaned sample canister would be then enclosed in a stowage case, and stowed in Orion for Earth return,” noted the presentation. “This approach deals with key planetary protection concerns. Crew inspection, cleaning, and encapsulation of sample enclosures prior to Earth return. Removes the need to robotically ‘break the chain’ of contact with samples at Mars, thus reducing complexity and cost of robotic missions. While the timeline for a MSR mission using both SLS and Orion – cited as 2024 – appears to be too ambitious based on the vehicle’s development and test flight schedules, it is highly likely NASA would look to both the commercial and international sectors as partners to conduct such an MSR mission. This now appears to be the forward plan, based on the recent statement of intent between NASA and ESA.